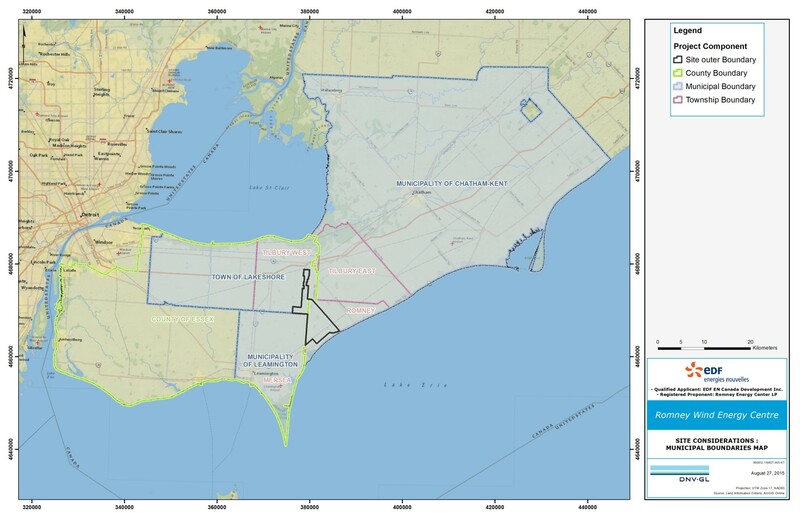 As part of the REA requirements, Romney Wind Energy Centre will be forming a Community Liaison Committee (CLC) to exchange ideas and share interests with residents and members of the public and Indigenous communities during the construction and operation phases of the Project. Encourage participation of local businesses. To learn more about Romney Community Liaison Committee, consult the CLC Public Notice and Participant Workbook. Around $ 170,000 a year for community initiatives and bring real added value to the community. Around $ 55,000 in annual taxes. More than two hundred (200) construction jobs at the peak of construction. Important opportunities for the local and surrounding economy during construction through (local services, contractors and materials for project construction, local businesses and hospitality sector). If you have questions, comments or any interest in the Project, please contact us at any time. Note: The Public Meeting mentioned in the notice above is the same as the Second Public Meeting through the Renewable Energy Approvals (REA) process. For more details about the environmental studies and the REA process, please consult the tab Renewable Energy Approvals. 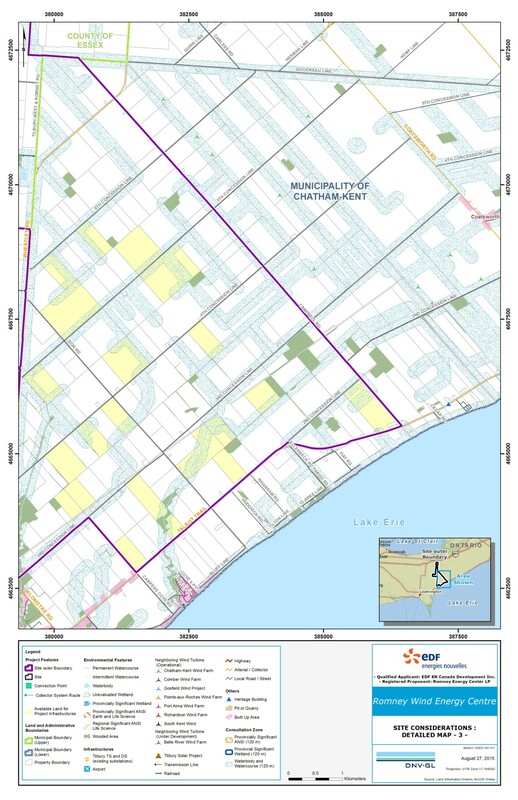 The Site Considerations Report and Maps gather Project features such as the Site boundaries and the proposed Point of Interconnection as well as local and provincial constraints regarding natural heritage, infrastructures, administrative boundaries, etc. 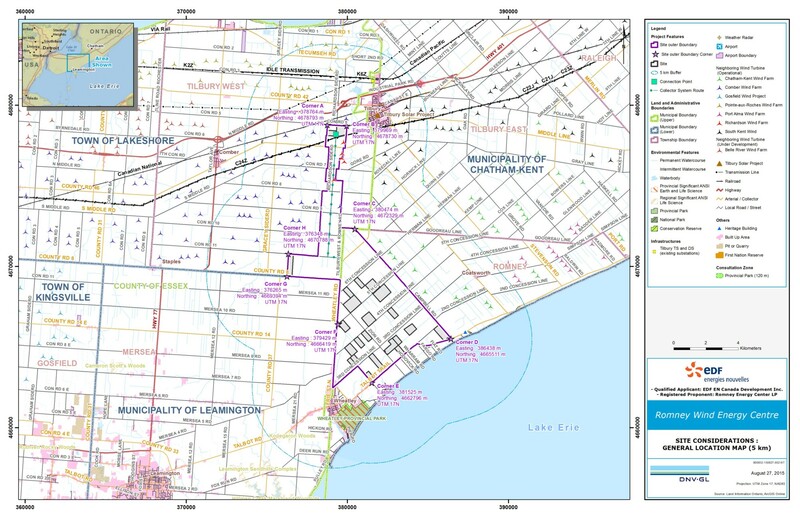 A detailed list of the main Site Considerations Information presented on the maps follows. Please note that the exact final locations of some of the Site Considerations information within the Project area, such as Project infrastructures, are not defined with precision at this time and will be determined via public consultation, and as Project area studies are completed. Technical and environmental studies help us better understand and minimize potential impacts on the community, the environment, cultural heritage, archaeology and other major items. Romney Wind Energy Centre Community Engagement Plan. Click here to view new searchable noise impact assessment – results and map indicating the maximum calculated sound pressure level at project receptors. Table is searchable by property address or PIN for receptors identified in the Noise Impact Assessment Report. 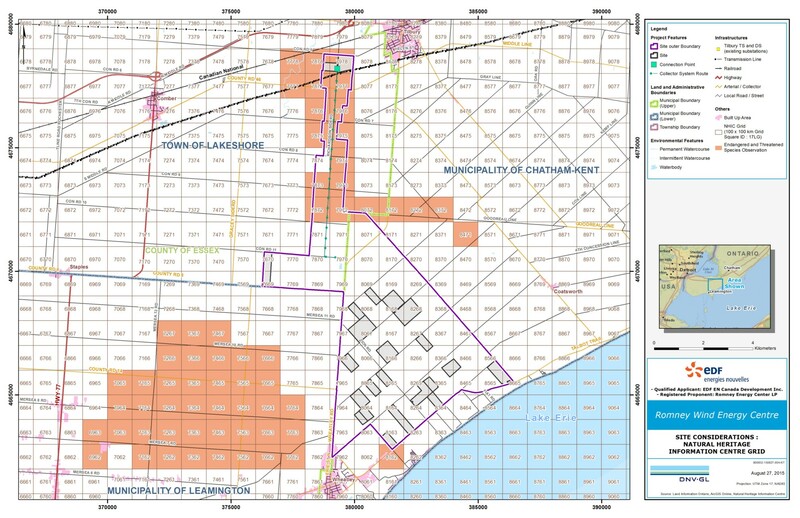 The project will be situated on more than 10,000 acres of privately-owned land, with a capacity of 60 megawatts (MW), located in the municipalities of Chatham-Kent and the Town of Lakeshore. The wind park boundary is approximately bordering the following roads: Middle Road (North), Highway 3 (South), Campbell Road (East), Highway 77 (West). 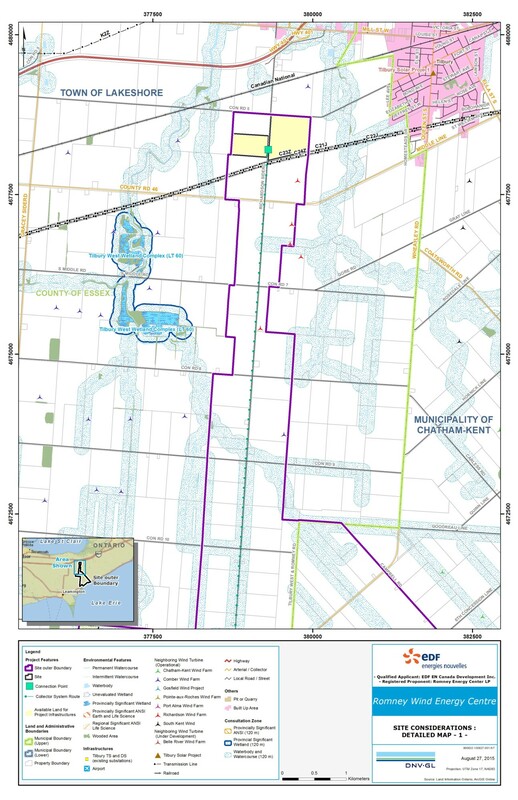 The connection point to the public grid is anticipated to be located within the Town of Lakeshore close to Richardson Sideroad. No Connection (transmission) line is required for this project.